Becoming Board Certified in Holistic Nutrition® or BCHNTM demonstrates that you have achieved the highest level of professional recognition and validation of your knowledge and experience in the holistic nutrition industry. To earn this valuable designation, you must demonstrate an exceptional level of knowledge and understanding of holistic nutrition by sitting through a board exam and in documenting client contact hours as outlined here. Credibility. 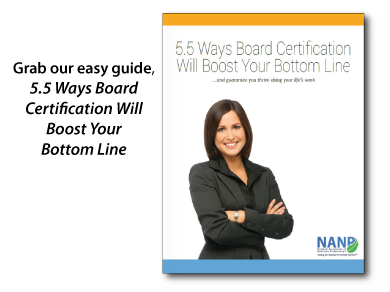 Board certification indicates that you meet the educational and ethical standards required by a professional credentialing body. Assurance. For your clients, insurance companies, the medical community, and other complementary practitioners, board certification proves that you are aware of and conduct your business within your legal scope of service and standards of professional conduct. Validation of your educational and professional qualifications. Confidence. There is nothing more personally gratifying than knowing you have achieved the highest credential offered in your field! Access. Purchase directly from Standard Process, Designs for Health and other wellness companies. The Holistic Nutrition Credentialing Board (HNCB) is the credentialing body founded in 2003 as a division of the National Association of Nutrition Professionals (NANP).